Gulf Center for Human Rights and Bahrain Center for Human Rights express their grave concern for the information received regarding ill-treatment of detained human rights defenders Nabeel Rajab and Zainab AlKhawaja in prison of Bahrain, as well as the continued exploitation of the judicial system to punish human rights defenders and hinder their peaceful and legitimate human rights work, as detained activists Zainab AlKhawaja is facing up to 13 cases, in addition to a 3 months imprisonment sentence issued against here on made-up charges. Further to the last update published by the GCHR and BCHR about ill-treatment of the imprisoned Human Rights Defender Nabeel Rajab in Bahrain prison by putting him in solitary confinement (read it here), GCHR and BCHR have received additional details in that regard. Sumaya Rajab, wife of human rights defender Nabeel Rajab, stated that she met Nabeel (4 September 2012) in Jaw Prison for the first time in three weeks. She continued by saying that in his solitary cell, Nabeel was stripped of all his clothes, forced to wear a small piece of fabric ("a wrapper") only, then forced to stand and sit 40 times as part of the physical torture he suffered despite the fact that he suffers from a herniated disc in his back, and has requested a special medical belt to help cope with the recurrence of pain. He was also hit on the back by security forces several times previously. Sumaya said that Nabeel does not know how many days he spent in that cell, because he could not tell day from night. In addition to the cell being generally dirty, Nabeel reported that there was also a dead cat in the cell. Sumaya confirmed that Nabeel doesn't eat the food he's given by the prison guards because he does not trust them, so he has lived for nearly two months on what is left of his corn flakes cereal and some canned food, as he's allowed to buy from the prison cafeteria only once a week. Also, he's allowed to only take 6 liters of water per week, although he suffers from kidney and gallbladder stones. Sumaya said that for the first time in two months Nabeel ate cooked food today, as his family was able to give him a sandwich. He is prohibited from having sugar as well. She continued saying that the prison administration refused to give Nabeel an electric shaver which she brought after Nabeel was refused shaving blades she brought the last time. As a result, he cannot shave and looks inappropriate, which she considers is one of the degrading actions committed against him. She said that the prison administration forces Nabeel to wear very small flip-flops, which he uses everywhere, even in court. And he's only allowed to have two pieces of clothing and two pairs of underwear. Sumaya confirmed that in spite of all this suffering, Nabeel's psychological state is very strong and that he always raises the victory sign. But in other upsetting news, Sumaya said police denied them their right to meet Nabeel for the full duration of a prison visit, which is one hour, as they were permitted to stay only 25 minutes with him. They strongly objected and refused this abusive treatment, which led officers in charge to scream at them, insisting they leave. According to Sumaya, the security officials justified this act by saying that it was late and that the police wanted to go home to their children, which Sumaya considered a clear provocation intended to harass and pressure them. She said that Nabeel didn't see his own children in three weeks, not even for a day, and they are wasting their one-hour visit causing a controversy. Sumaya said that Nabeel is still isolated from the rest of the political prisoners and prisoners of conscience, languishing in a common cell with 3 or 4 criminal prisoners, and he's not allowed to see anyone who enters the jail. Sumaya confirmed that she sent a letter in the hands of her son Adam to the President of Jaw Prison Mohammed al-Husseini, demanding the transfer of Nabeel to the same area as other political prisoners and prisoners of conscience, as he's the only one isolated from them deliberately. But al-Husseini’s response was to derisively claim that this is the best treatment he can provide to Nabeel, and directed Sumaya to make any complaint to the Department of Legal Affairs. Sumaya said that lawyers also met with the President of Jaw Prison for the same reason but he was stubborn and said, "Forget it." Sumaya confirmed that she herself had met Husseini previously for the same reason, where he claimed that this is not considered a prison isolation legally, because Nabeel is sentenced to 3 months only and can't be placed with the rest of sentenced prisoners. However, Nabeel is now sentenced to 3 years in prison, but he's still isolated from other prisoners of conscience to this day, without any explanation. In their treatment of Nabeel Rajab, the authorities in Bahrain are actively violating several articles and conventions, including the Universal Declaration of Human Rights and The Convention against torture. Article 5 of the UDHR reads: “No one shall be subjected to torture or to cruel, inhuman or degrading treatment or punishment”. 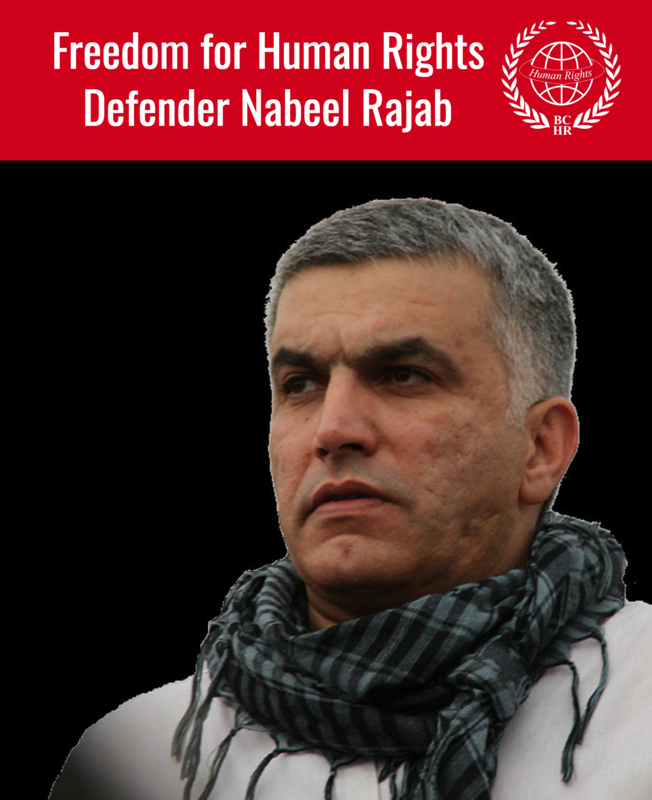 GCHR and BCHR consider the treatment of Nabeel Rajab degrading and therefore in clear violation to several international conventions and treaties. By not taking enough measures to prevent torture in their territory of its jurisdiction, Bahrain has violated the entire Convention against torture, which they signed and ratified in 1998. The state of Bahrain is furthermore continuously ignoring the UN “Standard Minimum Rules for the Treatment of Prisoners”, which since its creation in 1955, sets out the minimum standards regarding for example clothing, hygiene, food, inspections and medical services for prisoners, which creates very severe consequences for prisoners like Nabeel Rajab and Zainab Alkhawaja. Rajab’s next appeal date is 27 September 2012 in the three-year sentence for three charges of calling for “illegal gathering. Zainab Alkhawaja currently has thirteen cases against her, 7 of them are active at the court, including the case of ripping a picture of the king. Zainab has been already sentenced in several cases, to hundreds dinars fines and to imprisonment, she has been detained for several weeks on several occasions, and in one case she has been sentenced to 3 months imprisonment on 22 May 2012 for charges of assembling and disrupting traffic in Aali in November 2011, when she stood to stop the riot police from attacking the mourners of a man killed by the regime of Bahrain (video: youtube.com/watch?v=nPl-x7DGrao ) on 10 Oct 2012 the court of appeal will be hearing pleading in this case as the sentence has not yet been carried. And on 16 Oct 2012 the court of appeal will hold session on the case of insulting an official at the military hospital, while the court has previously acquitted Zainab but the public prosecution has appealed against the acquittal. On 1 Nov 2012 the court will hold a session on the case of “Disrupting traffic near the financial harbour in April 2011”. GCHR and BCHR have also received information that the public prosecution is still investigating into more cases against Zainab AlKhawaja where she is accused with “assembling and disrupting traffic”. GCHR and BCHR believe that the continued detention and prosecuting of Zainab Al-Khawaja is directly linked to both her work in the defense of human rights and democracy in Bahrain and her exercise of freedom to peaceful assembly and freedom of expression in accordance with the Universal Declaration of Human Rights. The organizations see this as part of an ongoing trend of harassment of human rights defenders in Bahrain which targeted the leading Human rights defender Nabeel Rajab with similar judicial harassments that concluded with giving him a 3 years sentence (refer to bahrainrights.org/en/node/5387). GCHR and BCHR are very concerned for the physical and psychological welfare of human rights defender Zainab Al-Khawaja, specially that she was not allowed to see her specialized doctor to monitor the condition of her injured leg since she was detained on 2 Aug 2012. By denying Zainab proper medical attention for her injury, Bahrain is violating article 25 of the UDHR regarding the right to health as well as the previously mentioned “Standard Minimum Rules for the Treatment of Prisoners”. During Zainab Al-Khawaja's court hearing on the 10th of September, the lawyer attempted to present an excerpt from the Bahrain Independent Commission of Inquiry (BICI) report as evidence, the judge refused to accept stating that the BICI report was now a matter of the past, and that they are looking towards the future. Similar to many other children in Bahrain who’s parent or parents are imprisoned, Zainab’s daughter Jude had to celebrate her third birthday without her mother today, last year her father was imprisoned during this special day. Her father wrote on twitter “I haven’t wept when I was arrested, tortured, physically and sexually humiliated, when I first saw my family after more than two months, when I was sentenced for four years imprisonment or when after ten months I was released, now I weep because I see Jude without her mother on her birthday”. To further harass Zainab and her family, her request to visit her father in prison was denied and she was not allowed to give her daughter a paper duck she had made for her birthday. In addition, Zainab’s request to visit her imprisoned father the human rights defender Abdulhadi AlKhawaja was rejected. 2. Immediately and unconditionally release all prisoners of conscience and activists including leading human rights defender Abdulhadi Al-Khawaja. 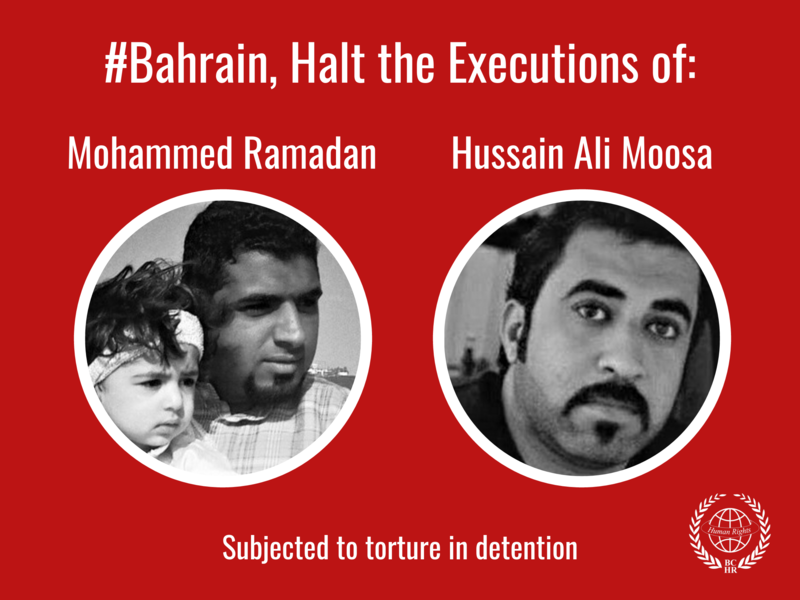 3.Immediatly put an end to the practice of torture and the ill-treatment of prisoners in Bahrain and bring those responsible to justice. 4. Guarantee in all circumstances that all human rights defenders in Bahrain are able to carry out their legitimate human rights activities without fear of reprisals, and free of all restrictions including judicial harassment. We reiterate our call on the international community to put real pressure on the government of Bahrain to stop the acts of ill-treatment practiced on leading human rights defenders and to release them immediately as we believe they have been targeted solely for their legitimate human rights activities.